A sample casting of one of the motion brackets was due to be made at Boro’ Foundry in late May for assessment and possible adjustment. Once the first bracket has proved satisfactory, the other bracket will also be cast and the two machined ready for fitting to the frames. We are still awaiting return of the firebox support bracket stretcher from machining. The return of the smokebox saddle to Bridgnorth after machining and shotblasting is imminent at the time of writing, and this will be immediately painted and bolted into the frames. Once this has been done, we can go ahead and install the front end dragbox assembly which has been completed and ready since late winter. We are anxious to complete the chassis assembly as soon as possible so that it can go into Bridgnorth Works for riveting and we can then concentrate on getting the pattern for the cylinders made and the cylinders themselves cast, machined and fitted. The Monday gang – in the absence of Tony and Chris who have been on footplate duties – have fitted the driver’s side trailing horn guide, achieving an exact, snug fit with the help of the SVR’s Dave Reynolds. The other horn guides and the horn blocks will follow. An initial attempt to forge one of the fourteen fork ends for the flexible cross-stays has proved successful, and the order has been placed for the material to make the remaining thirteen. The new Jonathan Clay image of a black-liveried 82045 was displayed at the AGM, and a number of people expressed interest in having a print. Chris now has a number of prints of this attractive portrait of our engine, and these are available unframed at a cost of £4.99 plus p&p (in a stiff-backed brown envelope). Please get in touch with Chris if you would like one. Tony has written about the plans to wheel 82045's chassis in his Engineering Notes. As he says, we think we will need about £150,000 to complete this job. It is likely that the finance to do this will be ring-fenced, so if anyone feels able to give this essential next stage of the project a kick-start, please get in touch. Please also, if you feel able, act as ambassadors for 82045 and try to persuade friends and colleagues to support this phase of building the new loco, too. Chris will be doing his level best over the next year or so to raise the necessary money, and would be very grateful for any help you can offer, including ideas for fund-raising. As mentioned in last month's notes, the Editor of one of the leading hobby magazines has expressed his support for 82045, and we have asked him if, at the appropriate time, he will give us a helping hand to raise the finance for the boiler. This is still a couple of years down the line but we are fairly confident that this final major phase of the project will attract a good degree of attention, particularly as it will by then be clear that 82045 is on the home straight. Stephen Goodwin, Geoff Bottoms, Steve Kirby, M J Banks, Richard Shaw, Steve Reynolds, Peter Lockley, Jeff Wood, Anthony Mole, John Cadmore, Steve Armstrong, Tim Powell, David Kilner and Richard Evans. Mr Goodwin will be featured enjoying his footplate ride later this year. Congratulations to all our winners and thank you to everyone who took part and supported 82045. Sam Goddard kindly drew the winners for us on a very windy Platform 2 at Bridgnorth on 22nd May. Thank you for your help Sam. 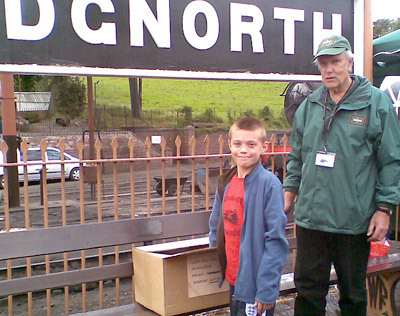 Sam Goddard is pictured with Tony making the draw for the Spring Draw on Platform 2 at Bridgnorth. 82045 member Matt Bull was the lucky winner of our `members only` draw to win a footplate ride. Matt enjoyed his trip with Tony and Chris on Monday 16th May 2011 and is pictured here with Erlestoke Manor, the loco of the day. Lifetime members qualify for inclusion in this draw and also those who pay a standing order of just £5 per month or more. Membership application and standing order forms may be found on the `How to Help` page.